One of the things in weather that fascinates me, and I’m sure many of you, is lightning. If you’re like me, then you could sit and stare at a lightning show forever. When you get the opportunity to see a storm that produces a lot of it, you oftentimes see all kinds of different types. You have bolts, some that appear to be a single strike, others fork or crawl across the sky and some just appear to flash like you’re taking a picture. Either way, it’s all mesmerizing. Let’s go through some of the different types so that the next time you catch a storm, you can impress your friends and family with your knowledge. The National Severe Storms Laboratory does a great of job of going into detail on lightning. I’ll try to break it down and summarize it. Simply put, lightning is a spark of electricity in the atmosphere. That spark of electricity can be displayed in a number of ways that boil down to two different types: Cloud-to-Ground and Cloud-to-Air. With Cloud-to-Ground lightning, you can think of that as the big bolts that come from the cloud and reach the ground. This happens when you have negatively charged particles in a cloud meet up with positively charged particles on the ground. Those positively charged particles usually come from tall objects like buildings, poles or trees. When the two opposite charges connect, BOOM! Well, really it’s more like FLASH, then BOOM! The strike occurs which produces the thunder you eventually hear! In Cloud-to-Air lightning, basically the same process occurs but just within the cloud or clouds. So the bolt never reaches the ground but remains in the sky. Both of these types are generally taking place in thunderstorms at the same time. Cloud-to-Air happens more frequently than Cloud-to-Ground but it’s impossible to predict when and where they will occur. If all lightning were Cloud-to-Air, we wouldn’t have to worry about the dangers. Unfortunately, that is not the case. As is often the case with Mother Nature, with the beauty comes a price to pay. And that is the danger of being struck by lightning. You may be surprised to know that there are actually 5 different ways you can be struck by lightning: Direct Strike, Side Flash, Ground Current, Conduction, and Streamers. 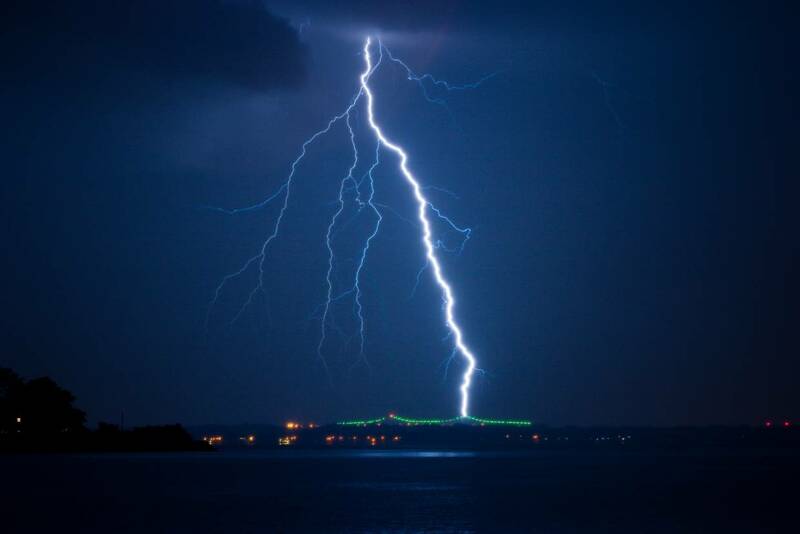 With a Direct Strike, the main discharge channel or main bolt of lightning travels through a person. This type of strike would be most common when a person is out in an open field or over open waters. In these open areas, you become the tallest object. In a Side Flash, lightning hits another nearby object. It could be a tree or a power pole. Once it hits that object, a portion of the current then jumps to the person. This is a big reason why seeking shelter under a tree is not a good idea! With Ground Current strikes, energy travels from the strike along the ground. If you are in contact with the ground, then that current could flow through you. Because the ground current impacts a large area, it is the cause of the most deaths and injuries. Then you have Conduction. This is the one way that you could be injured or killed from a lightning strike even when you are indoors. 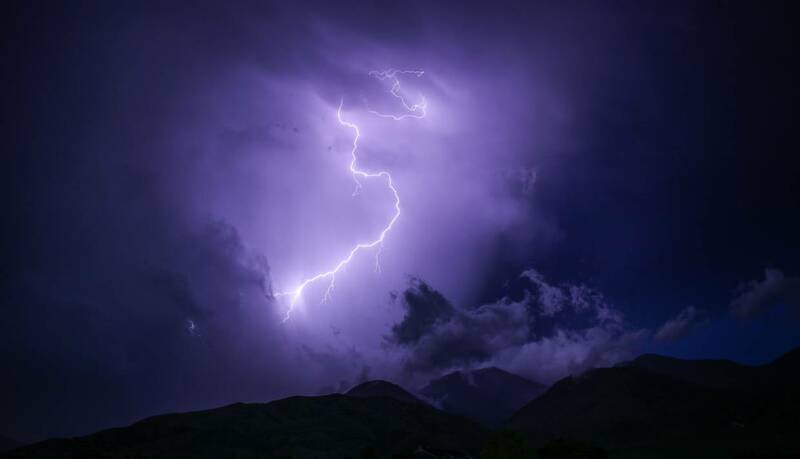 Lightning strikes your home and then travels through wires, plumbing and other metal surfaces. This is why taking a shower, washing dishes, or being on corded phones is dangerous during thunderstorms. And lastly, you have Streamers. This is not as common a cause of injuries but is still a danger. This occurs when another point, separate from the main lightning bolt, discharges. If it comes in contact with you, you could be a strike victim. According to NOAA, lightning kills an average of 49 people each year in the U.S. and causes hundreds of injuries. If you are lucky enough to survive a lightning strike, the effects are not so pleasant. It mainly impacts the nervous system but there can be other issues. The milder symptoms include: muscle soreness, headaches, and dizziness. Additional problems can be even more serious and life long. Difficulty sleeping, depression and even personality changes can result. So what can you do to protect yourself from a lightning strike? It really is very simple: GO INDOORS! There truly is NO safe place outside when a thunderstorm is near. My friends and family always laugh at me when I run for indoor shelter the moment I hear a rumble of thunder or see a flash of lightning. For one, I don’t want to be that Meteorologist who gets struck by lightning but more importantly, I like my life. Whatever is outside (pool, golf course, etc.) will be there when the storm is over and is not worth dying for. And once you are inside, avoid touching anything electrical or anything that has to do with plumbing. As I wrote earlier, this is a path lightning can take if hit hits your home. Hopefully, you are now a bit more enlightened about the weather phenomenon. It can be visually spectacular but make sure you take it seriously because it can be deadly. Walking from Wal mart with Family one afternoon. It was clouded over. Suddenly my husband ands all started commenting, wow mom, your hair is standing up on end. I threw my hands up over my head, ducked low and yelled get in the car as I sprinted for it. No lightening strikes. I insisted the family had been pulling my leg but they swear no. I have had an encounter 3 times with Side Flashes of Lightning. I wonder when the next time will be! All times I have been Inside. A Doctor told me I have too much electricity in my body. I cannot wear a watch. Is that the cause? I would like to know. Please help me. We have bad lighting storms in Minnesota, its just constant one strike after another. I thought the world was ending. What causes such severe lighting? It sometimes scares me. just in case anyone is interested. Again thanks for the article. I enjoyed it. Yup, true indeed. Thanks for sharing and thanks for reading! This article is great — informative and timely. BUT my question is: would a person be safe swimming in an indoor pool, the roof of which has a lightning rod? That’s the “discussion” I had with another swimmer when I exited the pool as a storm was gathering. BTW, the enclosure of the pool is on a concrete deck that is contiguous with the concrete deck around the outdoor pool! Thank you. No you are not safe in an indoor pool. You could be struck sitting on the poddy. LOL water is a great place for electricity to travel and this is what lightning is electricity. Get out of the pool ! I’d have to agree with DiFord! I would not take that chance even in an indoor pool. Thanks for the question and thanks for reading. Happy Safe Swimming! Very nice photos of the lightning! Great article! I had several very close encounters with lightning striking nearby trees (they split & burn) cliffs, & hills. During two of them, I was temporarily deafened from the thunder. I am a geologist who does field work in mountain & coastal areas, so I have lots of opportunities to observe lightning up close. One night driving down a nearly deserted freeway in Tulsa, OK, a lightning bolt struck my car directly. I was OK, but temporarily deaf. The air inside the car glowed blue for a few minutes after the strike, probably due to ionized Nitrogen in the air. The car would not start, the lights would not work, etc. for several minutes after the strike. However, it did eventually start after the static electrical charges dissipated and it did run normally with no apparent damage, so I drove home. It was a strangely quiet drive because I was temporarily deaf from the sharp crack of thunder. I can not imagine that experience, not sure I would want to go through that. But to see blue air… hmm..
That’s scary! Thanks for sharing! While working one day, years ago, making donation collections, an awestruck resident answered the door. They proceeded to show me a 150 tall old Douglas Fir tree lightning had struck, just feet away from their house. The tree had been split in a spiral fashion from top to bottom, jumped to their phone service line, leaving the receiver dangling from the cord of a scorched phone. Luckily, no one was using the phone at that moment. Oh my! Thanks for reading and for reading the article! While out for pizza, we heard a loud thunder, then the pouring rain fell. Upon returning home I noticed the clocks stopped. My husband went to check the breaker box, came back inside with eyes as big as saucers & said, “You better come see this.” Lightening had struck a beautiful queen Palm that a previous owner had planted three feet from the house. The lightening burned a four foot long gash in the trunk, shattered the top of the palm, which fell all over the patio & into the pool, jumped over into the breaker box & traveled thru the wiring in the house frying all low voltage appliances. We replaced $7000 worth of wiring & appliances, plus the tree, which was not planted close to the house. We were glad we were not in the house when the lightening struck! Wow! That’s crazy! Thanks for sharing and thanks for reading! As u mention lightening traveling thru wire ing and plumbing in your home, as now most. Plumbing is run with non metal or A form of plastic lines, can or does the energy still flow thru them, actually thru the water flowing thru them ? That’s a good point but yes the flow through water would still be a danger. Why no mention of jets and sprites?? I was just trying to keep it simple and to lightning that most people have experienced. But yes, jets and sprites are pretty cool. While not a direct hit, I took a secondary impact of lightning when it hit my building which has a corrugated steel roof and siding. I was standing on front porch during severe storm when huge bolt of lightning hit building. As the energy dissipated through-out the building, it radiated out and through me just as it was the steel. From head to toe as it moved through me, it was the most exhilarating feeling I had ever experienced in my life. It was like a pressure wave moving through me and it did not hurt me one bit. The thin steel on the other hand was making all kinds of strange noises. I assume this might’ve been a conductive contact? Woah…that’s wild! Sounds like conduction is what that was. I often read a description of lightning in photos as “positive bolts”. What are they referring to? I have a story I told my now 16 year old when she was fixing to start kinder. She has the same hair that Jay Leno has but in reverse. Dark all over and light in the center. She asked one day why it was that easy. Long story short, I told her it was because lightning struck close by when she was in my belly and it gave her lightning hair. 😂 Great article. That’s referring to bolts that essentially originate from the top of a thunderstorm where the positive charges are mostly located. Thanks for reading! I love thunder storms and the lighting especially when it’s so bright it hurts your eyes. They are the most beautiful creations of light ever seen. Thanks for writing your interesting and informative article. I have always been fascinated by lightning. You article is a reminder of how powerful lighting is and how to be safe from it. Like my life too! While I DO understand the dangers of lightning, I can not resist watching from my patio. Not exactly inside, but somewhat sheltered. It is fascinating! Thanks for reading!